Butchers Row House Museum at Butcher Row House Museum01531 635069work MuseumButcher Row House Museum is a tiny yet fascinating museum displaying Victorian life. 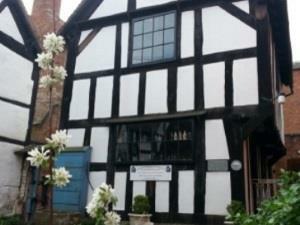 The Butcher Row House Museum is a quaint timber framed medieval building sitting snugly in the cobbled Church Street in the picturesque historic heart of Ledbury. Originally located in the middle of the High Street, it was one of 15 burgage houses and shops which were known as Butchers Row. You can imagine from the name the activity that used to take place here! When Ledbury was undertaking redevelopment in the 1830s, the little building was taken down and was kept intact and so in 1979 this gave the opportunity for the little building to be erected by the Ledbury and District Society. It is manned by volunteers. This little museum finds room for all sorts of artifacts including relics and trinkets from Victorian times and life in Ledbury as it was. Come and find out why there is a pair of mismatched Victorian shoes and see the Victorian folk curiosities, musical instruments and a hurdy-gurdy to a Tibetan pipe made from a thigh bone! Opposite the Heritage Centre, this museum is a hidden gem. Dogs: Guide dogs are permitted.